Do you ever think something up in your head and when you finally get the chance to make it, you find that it came out even better than you expected? 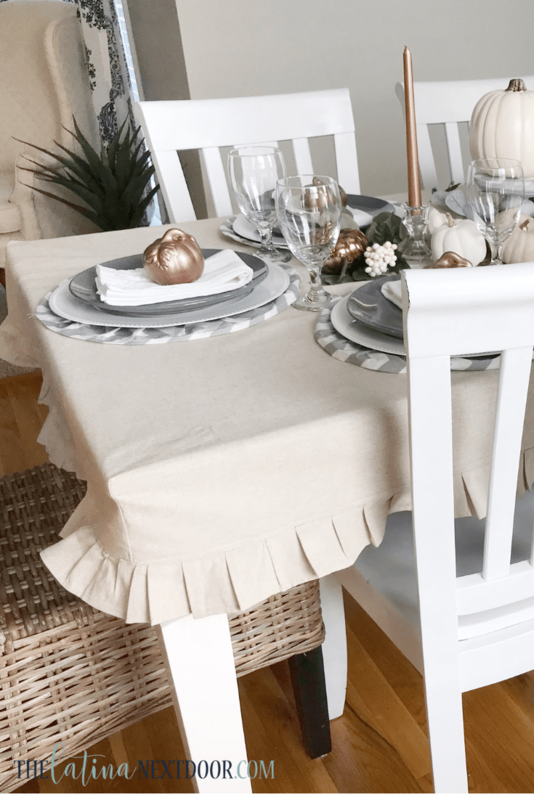 Well, I admit that doesn’t happen too often, but I was so happy when I made this tablecloth for my breakfast table – it was just perfect! 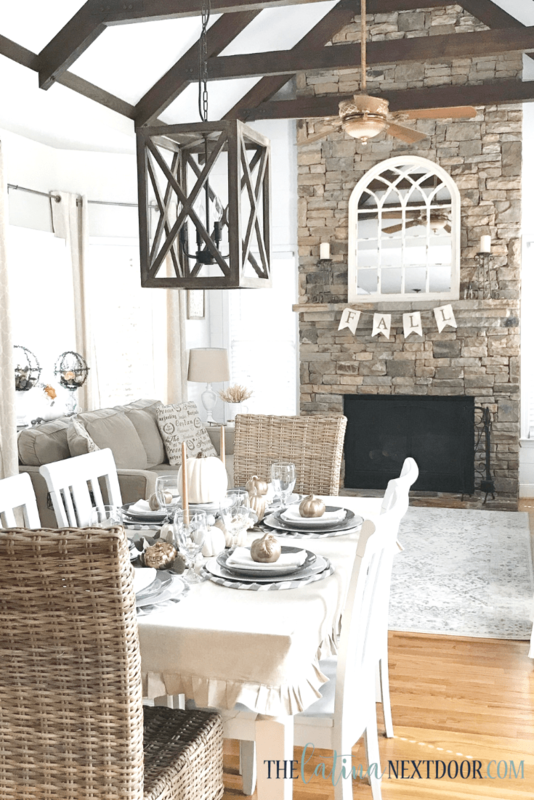 And when I shared my Decorate with Me Tablescape Video on my YouTube channel ERRRRRBODY wanted to know how to make one as well. Which totally blew me away by the way…. 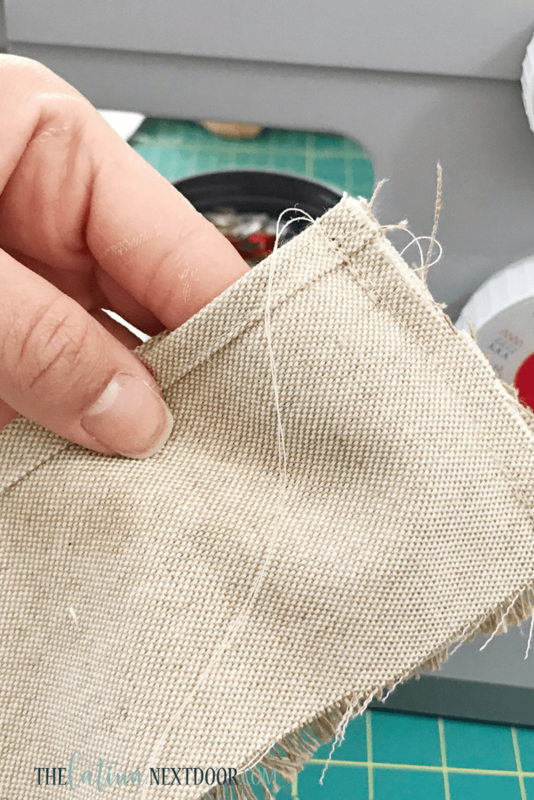 Luckily I documented everything and I was able to come up with a tutorial, both a step by step one for my blog and a video for the YouTube peeps (cause ya know, some people are visual learners… ahem… I know I am😉). 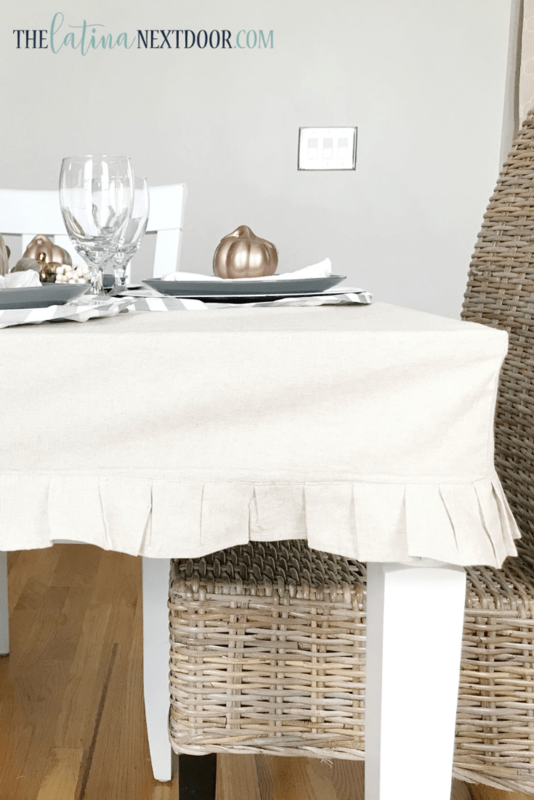 Anyways, if you are looking to spruce up your table with this adorable tablecloth, here’s how to do it yourself. Fabric of Choice (I purchased some upholstery fabric in the home decor fabric section at Hobby Lobby. 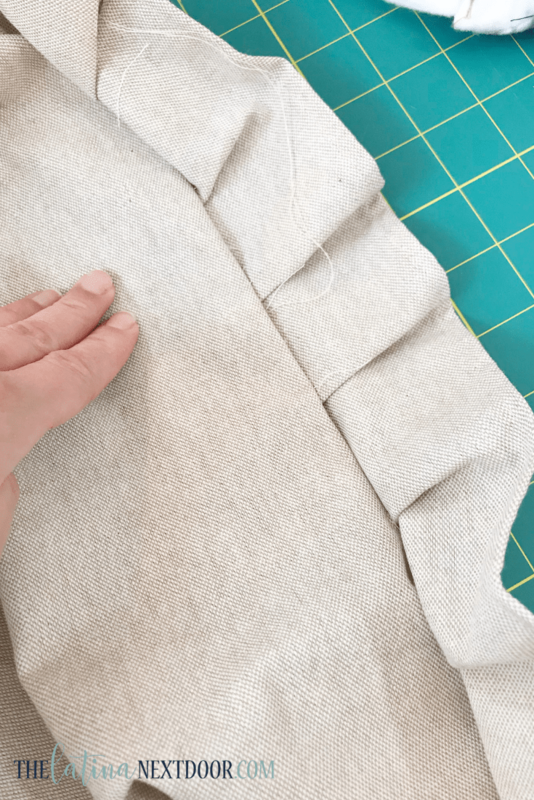 First you are going to drape the fabric over your table. 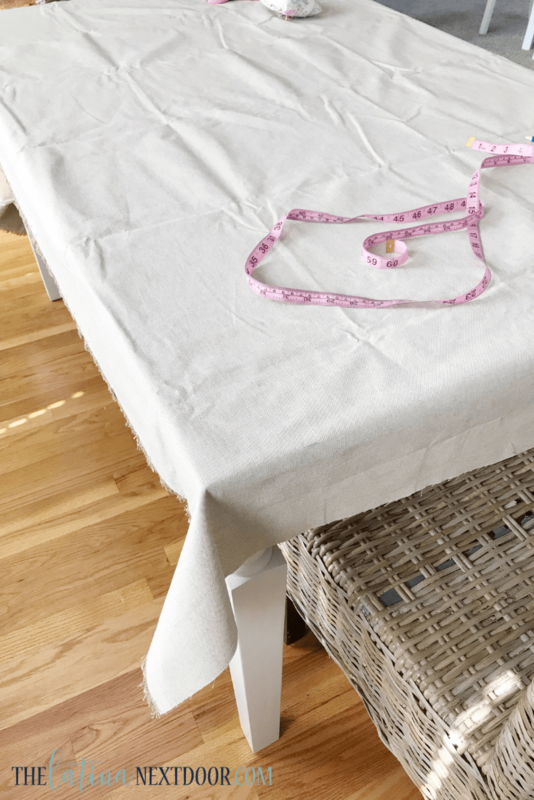 Next you want to measure how far down you want your tablecloth to hang down (without the pleated skirt). 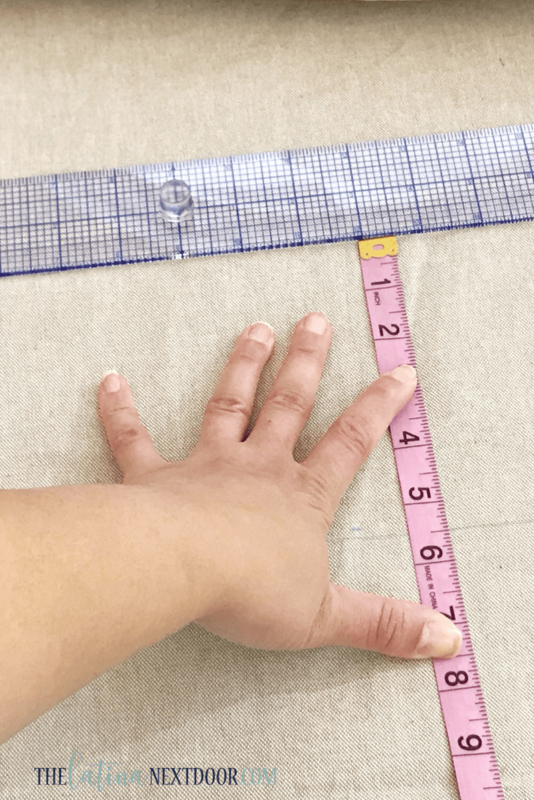 I measured mine 5 1/2 inches which included a seam allowance. After you do this you want to pin down the 4 corners with pins to keep them secure. Since my fabric came from one of the larger home decor fabric spools it was too long on 2 sides. 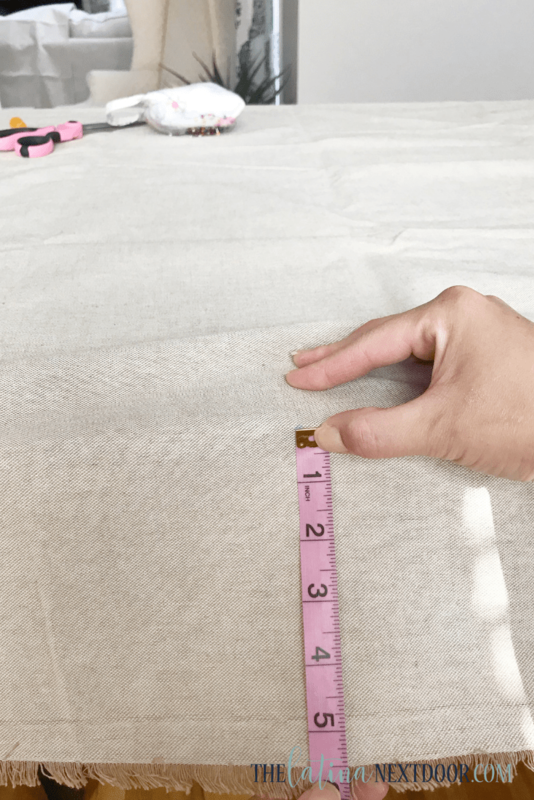 So after the corners were pinned, I marked 5 1/2 inches from the table edge and used those guides to cut the fabric the same length all around. After everything was even, I sewed all 4 corners and made sure the tablecloth fit properly. Once that was complete I cut 3 1/2 strips for the pleated part of the tablecloth. I sewed a hem on one side of all those strips. 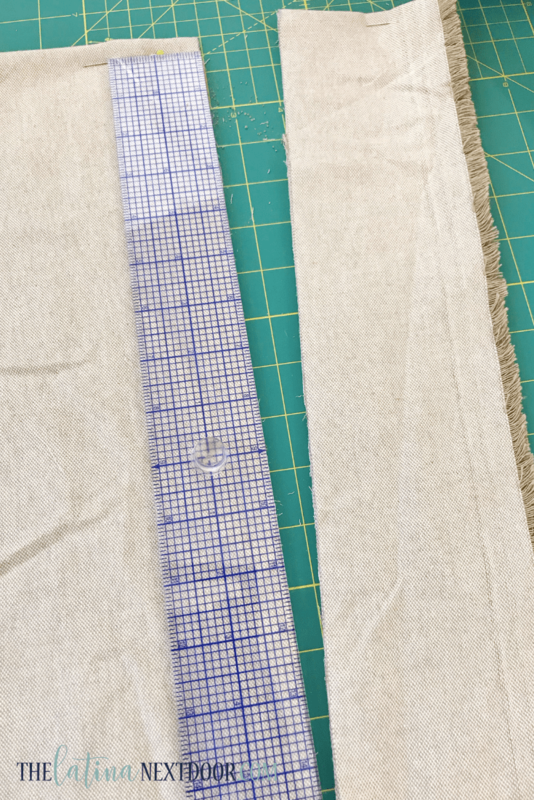 I then attached all of them to make one continuous long strip of fabric. 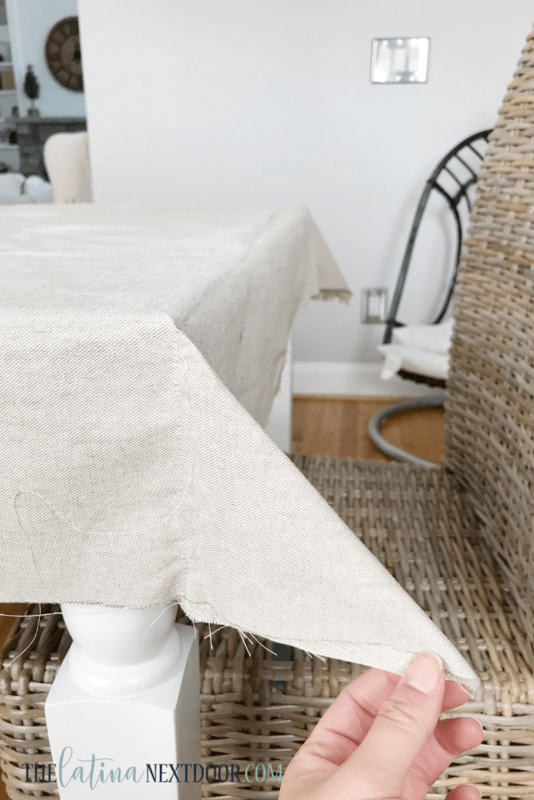 Then I proceeded to form the pleated border by adding those strips to the edge of the tablecloth. 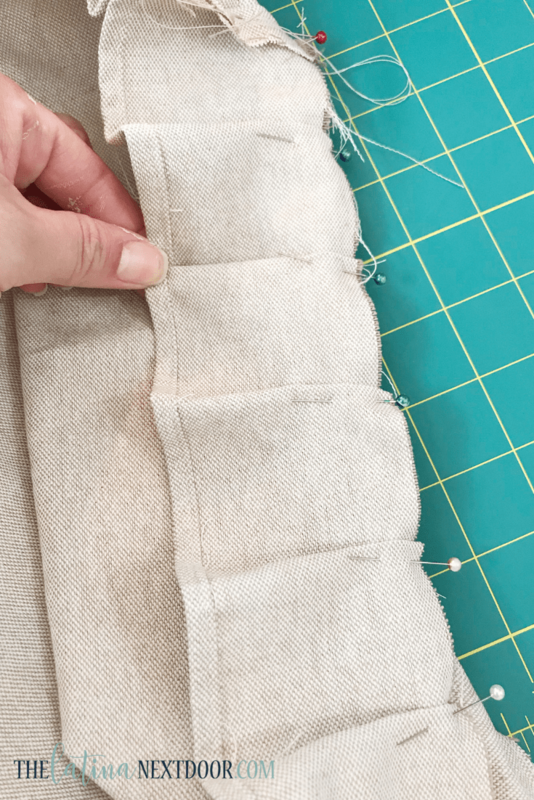 I wanted pleats but I just eyeballed the spaces between each one and set each with one pin (nothing too formal here). I started on one corner of the tablecloth and worked my way around. 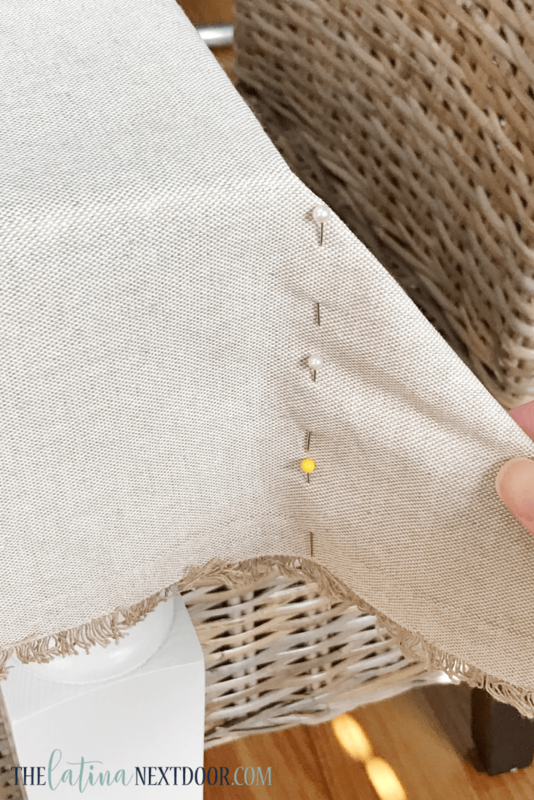 I made sure to hide the seams within the pleats so that when you look at the tablecloth you would see no visible signs of each strip seam. After that (and I totally forgot to take a picture of this) I used my serger to serge the tablecloth and pleat seam so that it wouldn’t fray. 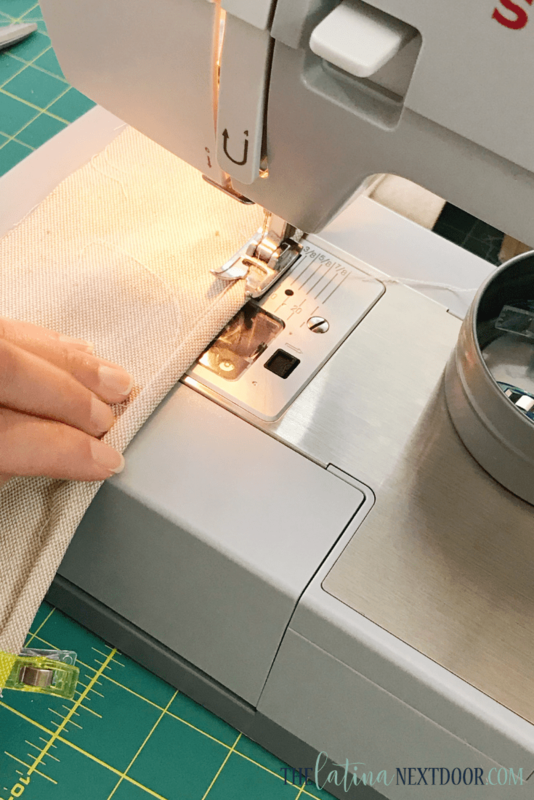 If you don’t have a serger you can totally use the zig zag stitch on your sewing machine. 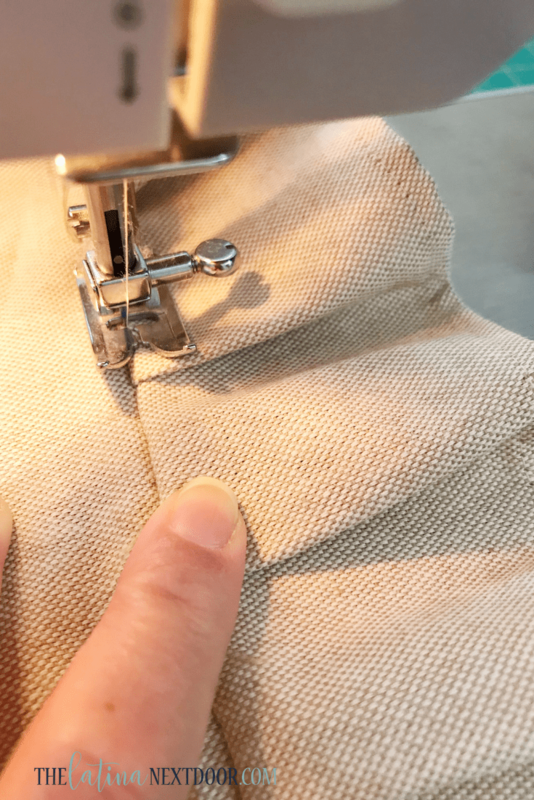 Then finally I sewed the pleats down so that they would lay flat and not rise up. And that’s it! You have the cutest tablecloth ever! I did iron it to get the pleats nice and crisp and smooth out any wrinkles. Eek! I love how it looks! 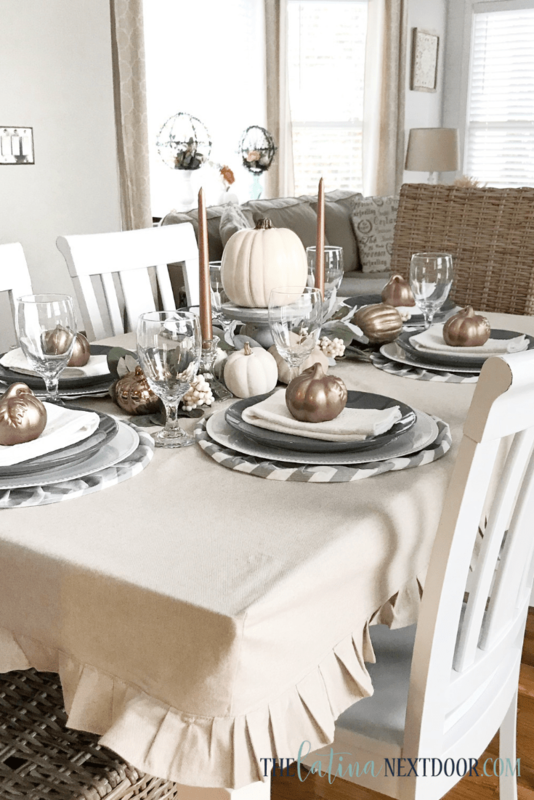 Since this was my breakfast table I no longer have my tablescape set up, but I still put the tablecloth on every day (I take it off when we eat on it though). What do you think? Would you have one of these on your table? 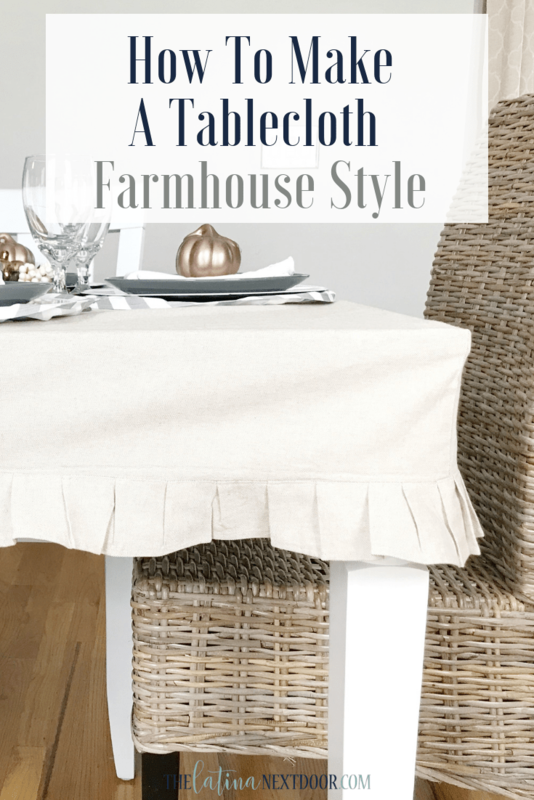 If you like the tablecloth then you will also appreciate my tutorial on how to make the fabric chargers/placemats you see on the table. You can find that tutorial here. This is my favorite tablecloth in the history of tablecloths. Your tutorial actually makes it look easy. Maybe, just maybe, I see another painters drop cloth project in my future. 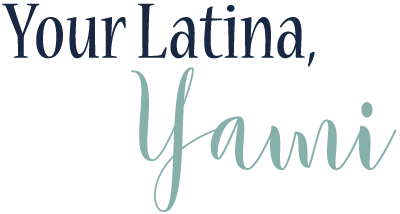 Pinned and will share on my FB page.